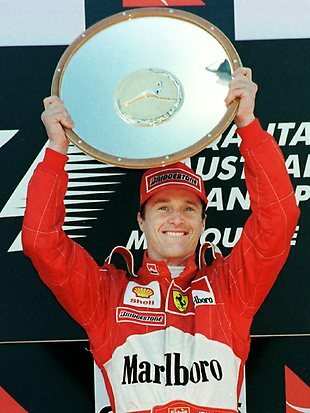 planetf1.com • View topic - Fondest Melbourne memories? Post subject: Fondest Melbourne memories? Post subject: Re: Fondest Melbourne memories? hamilton's first start in 2007 jumps to mind.. overtaken by kubica initially so goes to the outside and takes him and alonso round the outside into a gap just big enough for an F1 car..
brundle's crash was pretty spectacular..
One of my fondest memories has to be Kimi's win in 2007, that being his first race for Ferrari. 1996 - Villeneuve almost beating Hill. 1997 - Villeneuve being taken out at the first corner, Frentzen's brake failure (and Brundle's first ever commentary). 1999 - Irvine's first win. Never thought it would happen! 2002 - Epic race. Montoya vs Schumi, Trulli spinning off in the lead, it had it all. 2003 - Even more epic race. Schumi's car falling to pieces, damp conditions, DC's win. 2007 - Lewis Hamilton makes his entrance. The rest is history. 2009 - Brawn blow everyone away. Vettel and Kubica's bumper cars. 2010 - Jenson's first win for McLaren. Another wet/dry race. Wasnt that the race he almost fell asleep while in the lead? 1997 was a great race. 2003 was also really good. 2005 was my favourite as a big Fisi fan. 2006 was very exciting from what I recall. 2010 was full of events. 04 finding some shade, this pasty pom got seriously burnt. 2009: What a surprise that was. 2010: John Travolta on the grid and Jenson Button doing it all over again. Mark Webber driving a Minardi home to 5th place in his first ever GP, at home. Schumacher on row 2 last year. I've seen him win a few at Oz from not such winning situations, but it was still that feeling that he could do it back in the day. Last year, was a pleasant surprise. I think for me maybe JB in 2009. Just because he was pretty much a goner fromt he sport, and Brawn (despite money Honda gave them, the huge developmental budget and massive layoffs) were still kinda underdogs. Sure they were insanely fast in the tests but seeing them actually go out and qualify well with some fuel on board then go on and get the 1-2 (admittedly, it was slightly lucky when Vettel and Kubica came together - I think it was them). Lewis' start in 2007 was also spectacular. for those that didn't follow him in Gp2 and before, he was an unknown and in his first F1 race. He drove that day like a guy with 100 races under his belt. The ones where it was on at a decent enough time to stay up all night for were the best. 1996 Villeneuve spewing oil off the back of his car into Damon Hills face and down his overalls hehehe. 1999 - All the regular big hitters had an awful day and Irvine, Frentzen & Ralf took the top 3. They each went on to have brilliant seasons. 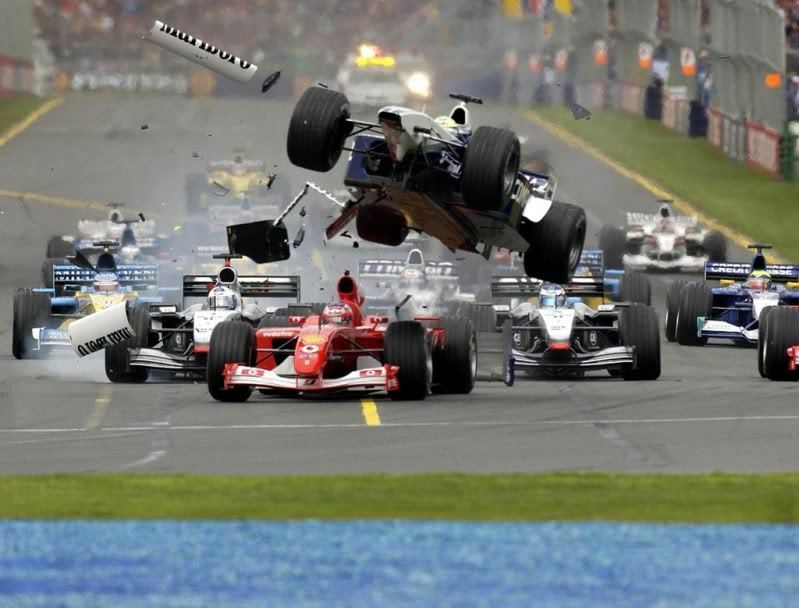 2002 - The huge startline crash that everybody walked away from. I remember being in shock when Ralf took to the skies. And Webber holding off Salo. 2003 - Ferrari finally had a bad day. Gave great hope for the season ahead. 2009 - The entire Brawn situation. Although Richard Branson nearly made me sick. 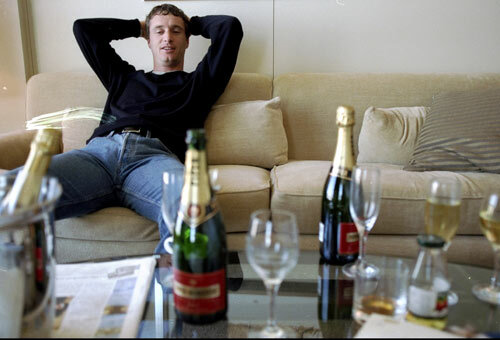 2010 - Jenson proved 2009 was no fluke. I think 1999 & 2010 are my favourites. hmm i see 3 bottles of champagne and 2 are unopened - lightweight!! You could be right..... I know the reception he got from the fans after winning that year was awsome.. If you were a fan of Eddie you might want to check this out.